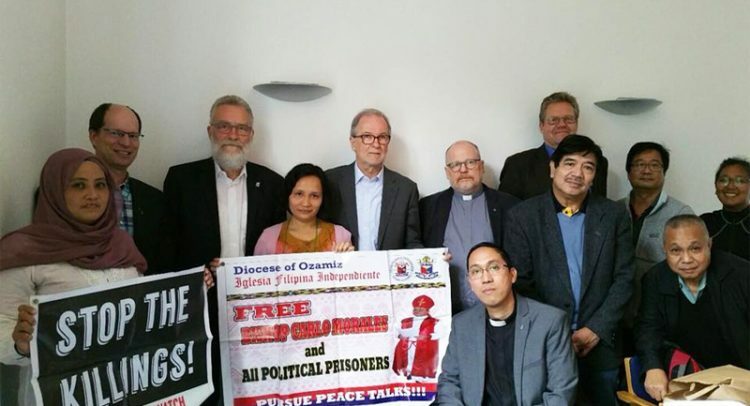 HAMBURG, GERMANY—An interfaith group gathered here on Oct. 4 reaffirmed their support for Mindanao after a meeting with two woman human rights defenders from the Southern Philippine island group. They listened to Amirah Lidasan, a Moro leader from the Moro and indigenous peoples’ coalition Sandugo. She reported on the Marawi crisis, and the ongoing and intensified militarization in Mindanao due to the extended martial law. “Duterte’s martial law clearly exacerbated the human rights violations in Mindanao, and his attack against the Moro people has fanned islamophobia,” she said. To date, about 400,000 individuals have been displaced from their homes in Lanao del Sur and Lanao del Norte provinces. She also reported on the bombing and other attacks on schools founded to service the Lumad, various indigenous groups who have historically faced neglect and aggression. Ma. Teofilina Morales spoke to the interfaith gathering on her detained husband, Rt. Rev. Carlo Morales of Iglesia Filipina Independiente. She revisited how a composite of police and military arrested the couple with two others at a checkpoint in Gango, Ozamis City on May 11, 2017. Ma. Teofilina and diocesan driver Isadome Dalid were later on released, but the bishop of the IFI Diocese of Ozamiz and NDFP consultant Rommel Salinas were falsely charged with illegal possession of explosives under Republic Act No. 9516. They still languish in jail as of this writing. “I could not believe that a man of peace such as my husband, who works for the Church and is a bishop of the church, would be targeted as enemy of the state,” she said. Ma. Teofilina urged the audience to continue advocating the freedom of all political prisoners, who now number some 430. President Duterte has flip-flopped on his promise at the beginning of his term to free them and seriously tackle the peace process. The bishop’s spouse also expressed her opposition to the persecution of church people, and the practice of filing trumped up charges against human rights defenders. Attending the meeting were Dr. Klaus Schäfer, director of the Center for Global Ministries and Ecumenical Relations of the Evangelical Lutheran Church in Northern Germany; Pastor Jorn Müller, Mission Center head for ecumenical affairs; Pastor Jürgen Bollman, Matthias Ristau and Nonielon Olmedo of the German Seamen’s Mission; and Rev. Fr. Walter Jungbauer of the Old Catholic Church in Hamburg, among others. Also in attendance the the Roman Catholic Church, Boyen Boliva for the International Coalition for Human Rights in the Philippines and Johanna Dela Cruz for the National Council of Churches in the Philippines. The two speakers were part of the Philippine UPR Watch delegation at the conclusion of the Universal Periodic Review on the Philippines last Sept. 22 and present during the 36th UN Human Rights Council session in Geneva, Switzerland. The Filipino group met the interfaith circle to strengthen the connection with the Philippines through the overseas Filipino communities and partnership programs. They also want to beef up solidarity work. An interfaith community in this city released on Sept. 14 a statement of concern addressed to President Duterte. The group, headed by Schäfer, appealed for the immediate release of Bishop Morales and Salinas, and asked the President to make good on his promise to release the political prisoners. Germany-based IFI priest Rev. Fr. Jun Mark Yañez, from the ecumenical staff of the Philippines for the Evangelical Lutheran of Northern Germany and the organizer of the Oct. 4 meeting, noted the importance of uniting Christians and Muslims in times of dissonance. “We must speak of deep solidarity amidst people’s pain and suffering, and be united against persecution and injustices,” he said.